With some of the projects we undertake at APlus, the goal is a complete redesign that changes not only the finishes but also the footprint of a kitchen, or even an entire home. 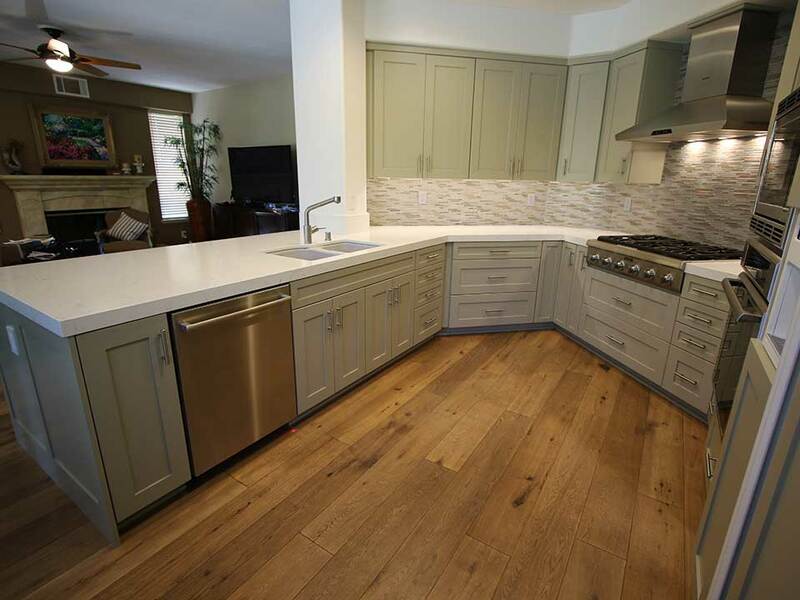 That wasn’t the case with this Huntington Beach kitchen remodel. 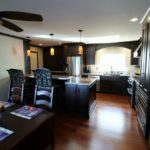 Instead, this Orange County kitchen design project was more about taking what was there and improving upon it, giving the home stylish updates and a modern feel, while maintaining much of the original layout of the kitchen. Prior to the APlus redesign of this kitchen, the cabinets were the primary problem area for the homeowners. They were very nondescript, featuring a standard single-panel inset design, in stark white. Since the kitchen has an angular layout, there were also corners that weren’t being maximized in terms of storage space. 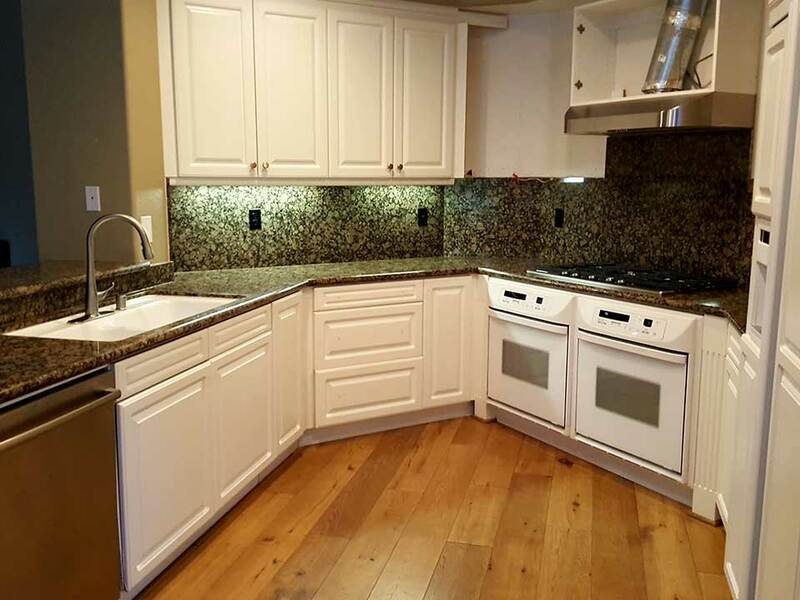 Also in the kitchen was a dated granite countertop in a very dark shade that was extended up the wall to serve as a backsplash. It felt heavy and out of place, surrounded by the white cabinets. Another issue was the set of double ovens located under the range. These took up valuable storage space and weren’t necessary. There was a peninsula-type area that extended away from the sink in the original design, but the bar featured by this design limited both seating and prep space. 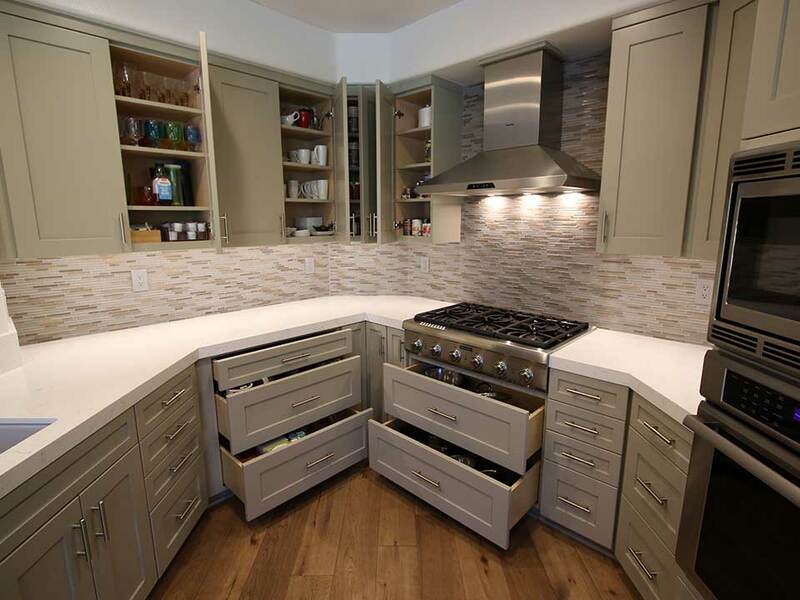 The custom cabinetry was designed to take center stage in this Orange County remodel. The cabinets were designed to reflect a transitional style, with a fresh and unexpected color palette. 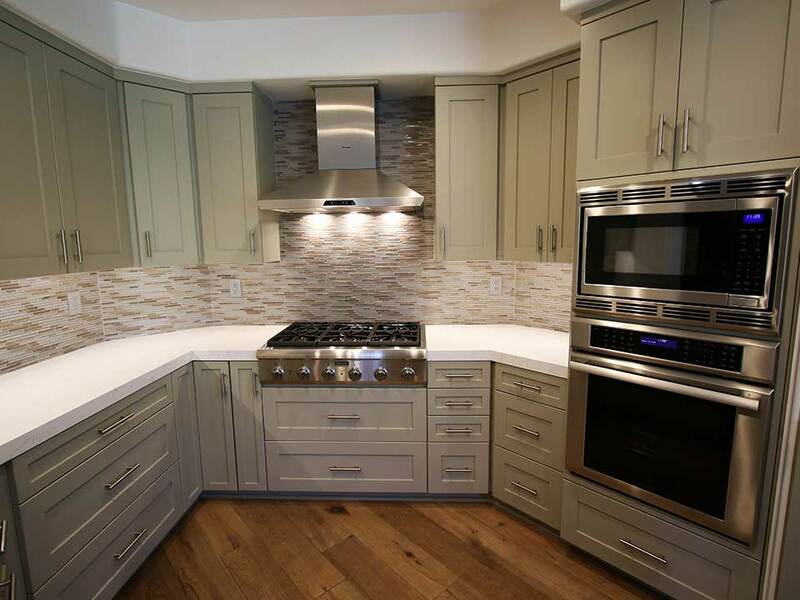 The APlus team worked with the owners of this Huntington Beach home to create a plan for Shaker cabinets with wide, 3-inch frames. Soft close upgrades were added, and the interior construction of the cabinets was durable maple. The color selected was Sage Green, which is a soft, subtle shade of green that works well for a transitional kitchen design. The drawers were of particular note in the lower cabinets. They were designed to be not only accessible but also deep and perfect for adding additional storage and functionality. 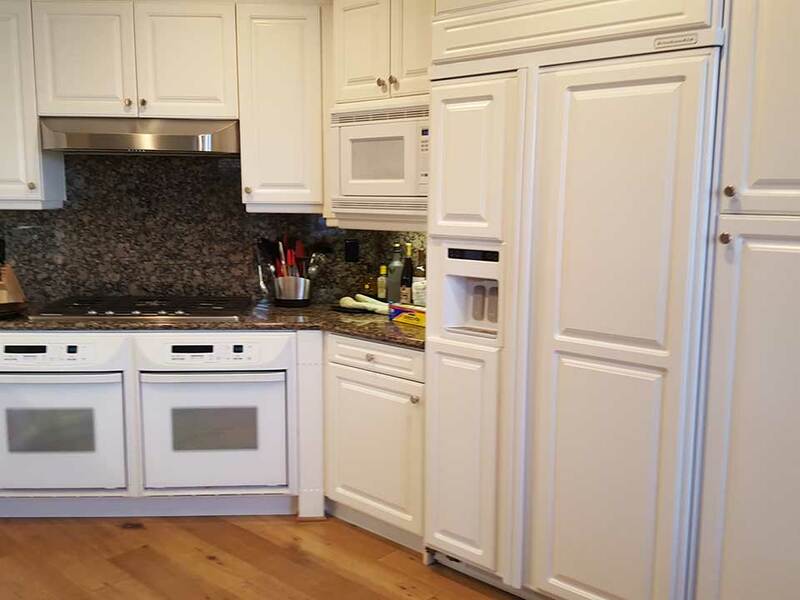 The double ovens were removed, and two very deep drawers were added below the range. Smaller drawers were added in the corner to the right of the range, while the corner to the left features a lazy Susan addition. There were also customized additions made to the cabinets like vertical tray dividers. Under-cabinet lighting adds ambiance to the kitchen, and highlights the glass mosaic tile backsplash that runs from the countertop to the start of the upper cabinets, and along the entire wall behind the range. The bar area was extended and widened, making the perfect space for dining, entertaining and food prep. It’s all one level now, making sure space is maximized, and it provides a better open-concept feel to the living area. 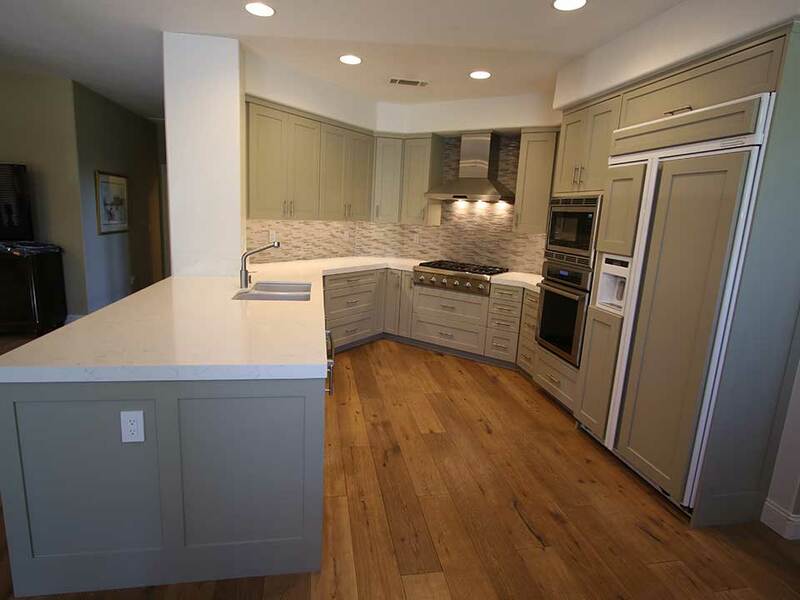 The white polished Pental Quartz countertop makes for a beautiful color contrast with the Sage Green cabinets. The edge is a 2 1/4 -inch square mitered edge, and the quartz features a polished finish. Also added to this Huntington Beach kitchen was a Kohler Executive Chef double kitchen sink in cast iron. Other appliances include a Thermador built-in convection microwave, 27-inch oven from the Masterpiece series, now located on the wall alongside the refrigerator and a 36-inch Thermador cooktop from the Professional Series. Over the cooktop is a 36-inch Thermador stainless steel wall hood with blower. 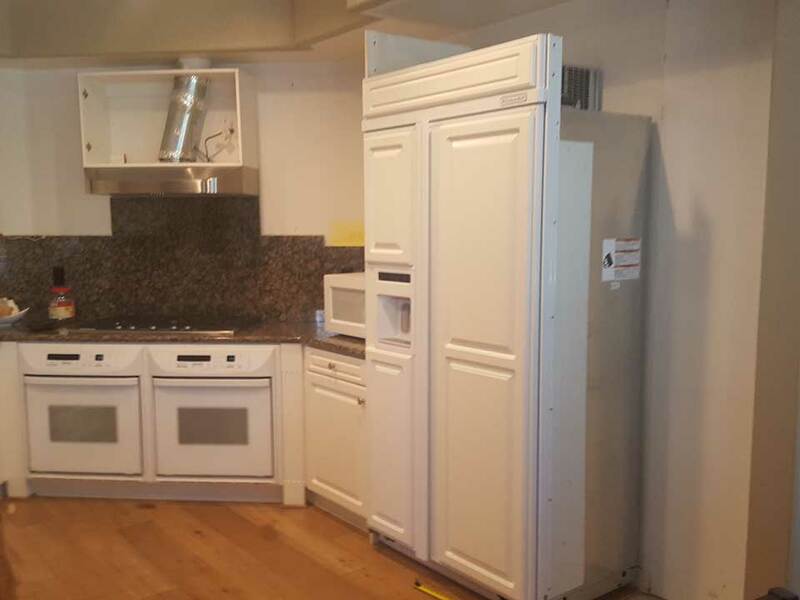 The existing French door refrigerator remained from the original design of this Huntington Beach home but was replaced with custom doors matching the cabinetry. APlus also worked on a remodel of the homeowners’ laundry room, adding a Kohler under mount sink, and Sage Green cabinetry, as is found in the kitchen.